"A play that is almost impossible not to like, combining qualities of a fairy tale and tall tale with those of a wacky comic strip adventure. ...wickedly funny yet touching script." "….zippy, playful, savvy, and even, at times, delightfully lewd." "A sneakily substantial piece of eye-candy." DOTTY: 23. Childlike and loving and hopeful, bursting with intense enthusiasm for everything. She refuses to think ill of anyone. HAMEL: 30′s-40’s. Dotty’s thuggish husband. Very very very not smart. Loves his wife but is led by other credos and urges. ZENA: 30′s.-40’s. The proprietress of Zena’s Beauty Emporium. Miss Tri-boro Area for two years running. Tough as nails. "You can enjoy Out of Sterno for its cheerfully non-doctrinaire tale of feminist awakening. You can also enjoy the show for its Crayola/Hello Kitty/Maira Kalman cartoon exuberance. But, like Dotty, you don’t have to accept any false choices — you can enjoy it for both." 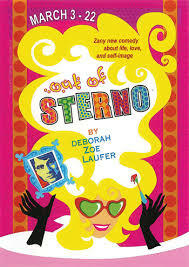 "Despite (or perhaps because of ) the show's heavy subject matter — oppressed woman forced into self-realization — Out of Sterno is zippy, playful, savvy, and even, at times, delightfully lewd."